Get this free one page website template to make a portfolio website. This is an ideal suit for freelancers, designers, and other creative professionals. Alstar features a super responsive interface, with ample of prebuilt elements to make a one page website with ease. It’s easily customizable, beautifully organized, and purely modern. The device-agnostic layout of this free one page website template works well on various screens and platforms. To craft a portfolio as a designer, freelancer, developer, creative, or even a team – Alstar accommodates all, perfectly. 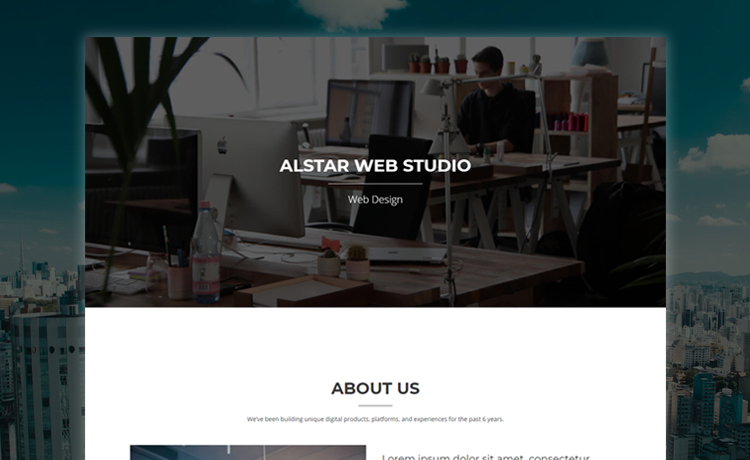 It’s already described that Alstar is a Bootstrap one page template with responsive features. Its clean ambiance and simple design is another reason we have considered while adding it. But the compelling on-scroll animation and engaging parallax effects will surely make you brag about your site. In addition, the notable features like a big hero header, service section with carousel slider, and text rotator are there to fulfill your need of making the presentation more effective. With this one page responsive website template, one can comfortably build a brilliant personal website. Surprisingly, the portfolio gallery with thumbnail grid is the best part of this free website template. When you click on an image, you can see the preview with a detail. Also, you can add background separately on each photo. Besides, there’s a single CSS file dedicated to the color setting. It’s an easy way to customize the color of the template. Correspondingly, it has contact form validation form which is not fully functional, but you can utilize it as a preliminary template. To sum up, the need for a free HTML template is enormous. We suggest you check out the free templates. If you’re a Bootstrap lover and need tailored and well-coded Bootstrap templates, please visit our premium section. We built the last few HTML5 templates with Bootstrap 4 which are ready to give you a great advantage promptly. I like the segmentation of sections most.